For information on key dates and events taking place during the 2019 season, click on the 2019 Events Calendar menu below. Go to the month and you will find the scheduled events and activities. For more details, click on the date. What is the T-Ball Division? T-Ball is broken down into several divisions which we call T-Ball Instructional for 5 year old players, T-Ball Minor for 6 year old players and T-Ball Major for 7 & 8 year players. T-Ball is the next level of play in Oakville Little League for young players primarily between the ages of 5 and 8 who have played Blast Ball or who are new to the game of baseball. 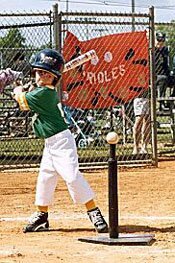 The primary focus of T-Ball is to teach children, coaches and parents the fundamentals of baseball throughout the various levels of T-Ball setting the foundation to move to the Minor division and beyond. T-Ball is intended to be a fun, non-competitive skills development program. Game scores and individual team standings are not recorded until players reach Major T-Ball. Players will be exposed to the basics of baseball including hitting, catching, throwing and base running. All players on the defensive team play in the field at the same time and every player hits every inning. There is one practice per week on Saturday (maybe Sunday depending of field availability). Games are played on Monday to Thursday evenings. Teams will play 1 game a week . Participation trophies are given to all players at the end of the season.